Controls lice and flies on beef cattle, lactating and non-lactating dairy cattle and calves when applied as a pour-on, mist spray or back rubber. Controls keds on sheep and lambs when applied as a pour-on. Controls flies on horses when applied as a wipe-on, pour-on or ready-to-use spray. 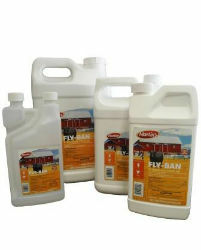 Use as a premise spray in and around animal housing. 1 Gallon treats up to 252 head of 1000 lb cattle with four weeks residual.